Mirai Retronium | Flickr - Photo Sharing! Up until recently, I felt there was a large gap between the quality of mobile games compared to ones for game consoles. Maybe its because many mobile games are developed for a quick buck instead rather than set out to be something that stands the sands of time. Have you played Japanese mobile games? Many of them are designed in a way to enable train commuters in Japan to play with one hand - their other hand holding onto a strap or pole as the majority have to stand during peak hours. Commuting time is on average 1 hour - the game has to have stuff to tap away for that journey and is one of the reasons why there are so many meaningless dialogs that pop up. You will notice that many of these apps are 90% tapping on dialogs and 10% action (if any). The thing about all this tapping away is that you will notice things like "you got rare card!" and a whole load of other "rare" stuff by just tapping - you could be looking away from the screen for five mins and after looking back see that you have unlocked a load of achievements - all with no effort at all. We start to notice a trend that games make the player feel that they have achieved something from doing nothing - but one can't do much anyway from being stuck on a packed Tokyo train so the games are designed to make them feel like they are achieving something during their journey. And then there are the cards. Many Japanese games are about collecting cards - so much so that if you look at the screenshots for apps on Google Play for example you see that there are no screenshots of the games - just the girls on the cards. For most of these games that I played, many seemed to be designed to take your money through in-app transactions which means that you can only progress to a certain point before having to make an in-app purchase. 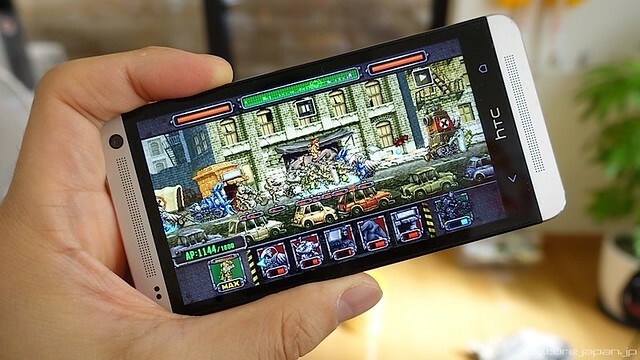 There is one mobile game however which I felt was on-par with console games and actually the best game I've played for a mobile device - Metal Slug Defense. The game is a new approach to Tower Defense and utilizes the retro graphics from all their previous titles. The presentation and playability of the game is so good that I payed for in-app stuff to get me more features that made the game even more enjoyable. I felt that If I could shell out 60USD on a Vita or PS3 game then 30USD on in-app purchases in Metal Slug Defense was worth it - and still be cheaper and better than many console games. This post contains a video, click here to view.